I had arranged to get lunch with my friend S. We picked a corner in the East Village to meet on and decided to pick a cuisine from the several options available to us there. That corner was 2nd Street and 1st Avenue, and the restaurant we picked was Lucien. Lucien is a French bistro that had come highly recommended and that I have passed often and forgotten to try. It’s very small—only a few tables—and the bistro ambiance is quite authentic...cozy, busy-feeling, full of fresh tulips and good smells. S. and I poked our heads in on that fortuitous afternoon (yesterday) and asked to consult a menu. "A little pricey," I said. It's actually very affordable for fancy French bistro food, but as a new graduate, I'm doing my best to conserve my funds. "Let's try somewhere else," said S. We headed towards the door. "Where are you going?" inquired a strongly accented voice from behind an adjacent table. Two portly figures reclined there, the man in a bright blue jumpsuit, the woman festooned with a bulky, bun-shaped knot of silver dreadlocks. Both wore thick-lensed, black-framed, owly glasses. We apologized, confessing that the menu was out of our price range. The bun woman shot the jumpsuit man a meaningful look. Let me take a moment to relay my thoughts here, which were, WHAT?!?! “He is perfect,” said the bun woman in a semi-indeciperable accent. She stood, adjusting an elegant black shawl, and picked up a bundle from the booth beside her. She handed it to S. “You go in bathroom, you put this on,” she said, waving her hand dismissively. S. unfolded the bundle, finding a nice button down shirt and a suit coat. He looked at me. I looked at him with an expression that says, free lunch at Lucien! Do whatever she wants! - Jumpsuit man is Lucien. - Bun woman is the head of a “very fashionable and important” Italian newspaper. - There is a photographer waiting in the booth next to me for a shoot. 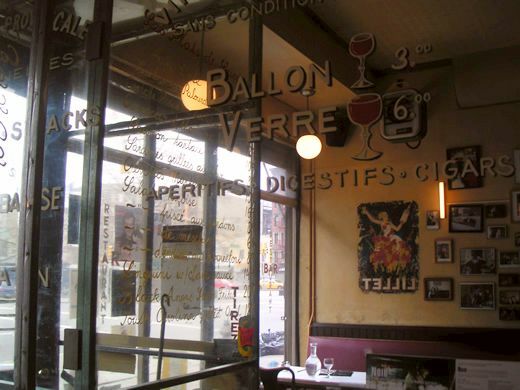 - The pictures will be in an article about where Europeans should eat when they visit New York City. She had no idea what role S. might be playing in these pictures; the best hypothesis I could get out of her was that he might be playing a waiter or a model. S. is a good-looking guy and could pass easily for either of these, but Lucien and bun woman were deep in conversation with the photographer and unavailable for comment. S. came back from the bathroom looking dapper. He looked around, waiting for direction, and receiving none, sat down with me and ate crusty French bread and butter. At that moment, a handsome older man came in and was greeted warmly by both Lucien and Bun Woman; S. and I speculated that he might be the head chef (if Lucien isn’t himself), or perhaps the proprietor of Lucien’s sister restaurant, The Pink Pony. Bun Woman’s assistant handed him an elegant shirt on a hanger, which he changed into in the middle of the restaurant. Then Bun Woman motioned for S., who was ushered into the booth and sandwiched between Lucien and the newcomer. Lucien roared for the waitress in French, commanding wine and food for the photographs. Bottles were uncorked and glasses were filled—all while S. fussed with his hair and shot me perplexed looks across the room. The in came the photographer with a big fancy camera! He snapped rapid exposures of the three men sipping wine, talking and fake-laughing, S. looking fabulously like the perplexed male model wedged between infamous restaurateurs. When the food came, S. was ushered out of the booth, and the food was photographed on the table by itself: thick, juicy Carré d’Agneau aux Flageolots (Rack of Lamb with flageolet beans, menu price: $24) and the most beautiful bouillabaisse I have ever seen, with enormous whole prawns arranged like a pyramid in a steaming bowl of mussels, calamari and aromatic broth. Lucien leaned across the table to inform us that his bouillabaisse is so authentic that they don't even make it like this in Marseille anymore. While S. changed back into his own clothes (an equally snappy jacket and button-down), I tried to pry some details about the shoot from her—like, say, the name of the magazine, or when it would be published—but her accent was incomprehensible and she was too busy to talk to me anyway. Before we could even manage a thank you or a goodbye, she bustled outside and a bottle of wine appeared on our table, followed by fabulously garlicky escargot and a half-dozen succulent Blue Point oysters with homemade cocktail sauce. We ravenously devoured these, and they were replaced by an artichoke-asparagus-arugula-hearts-of-palm salad (which was just perfect! 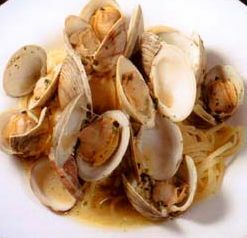 Served with teeny little halved cherry tomatoes and a light, lemony vinaigrette) and clam linguini (which was the real thing, shells and all—no cream sauce or anything, just the juicy clams and briny, garlic-infused oil on the linguini. To die for!). We finished with warm and flawlessly creamy crème brulée (which was uncharacteristically served in a broad, shallow dish—more caramelized crust to break! Yay!). Lucien would accept no money and was emphatic that we come back and remain neighborhood friends. He even gestured to the wall, where pictures of celebrity guests hung, and told S. that he would surely be up there soon! And that, friends, is my recommendation for Lucien. I can’t promise that you will get to pose as a waiter in an Italian photo shoot, or that anyone will slip you a hundred-dollar bill…but I can assure a very friendly proprietor and a perfect bistro meal. when opportunity comes your way...say, "Yes"...etc. Your world is just full of surprises! May they all be good ones! Great story. Another reason or you to love your LES. That is way cool! You have to find out what magazine that gets published in so you can get a copy for memory's sake. What an amazing story! Wow ... and it couldn't have happened to a better person. I hope you and S. enjoyed every minute of it! And if I ever visit NY I will most definitely be heading to Lucien! now THAT is a real new york moment!